There are several ways you can purchase Birmingham City Football Club ticket which include online purchase, by phone, by email or in-person at Blues Store, St. Andrew’s Stadium. To buy the tickets by phone, you can call 0121 772 0101. Birmingham City Football Club is a professional association football club in the Birmingham City. You can buy season tickets or ticket for particular game for the league matches. In order to maintain the family friendly environment in the family zone, certain guidelines are provided. Usually the adult to child ratio is two to one. All juniors under 14 must be accompanied by an adult. If you are to buy tickets from Blue Store, it is better you go there during opening times. The opening times are 9am to 5pm from Monday to Friday. On Saturday it is 9am to 1pm if it is a non-matchday and 9am to kick-off plus 15 minutes after the final whistle if it is a match day. 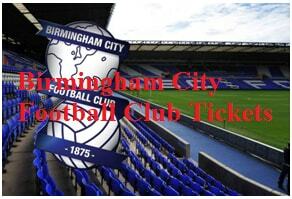 In order to buy ticket online and use other features, you must login to your BCFC account. To have your login user id and password, you must register your account for the first time. Visit the link ‘Register’ displayed on top right of the home page. Fill up registration form providing your email address, password, personal information, contact information and delivery information as instructed. Click ‘Complete Registration’ button. Your account will be created immediately. Visit the link ‘Sign in’ displayed on top right of the home page. Enter your email address and password in the fields specified in the sign in window. Click ‘Sign In’ button. Visit the tab ‘Match Tickets’. Select ‘Buy Tickets’. Browse through the page to find the match for which you want to buy the tickets. Click ‘Find Tickets’ displayed next to it. Make selection for number of person and select the stadium. Click ‘Find Tickets’ button. Go on ‘Proceed to Check Out’. Make payment giving your credit/debit card account details. Review your ticket details and confirm it. Buy Birmingham City FC tickets in advance and enjoy your favourite games!